We last reviewed most of these companies in 2012. If you’re curious to see how they compare then vs. now, read Scarlett’s review here! 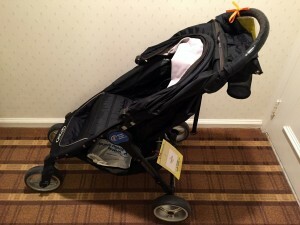 Each stroller was reviewed for at least half a day, and none of the companies knew it was for a review. Amenities: Any extra features such as cup holders, baskets, sun/rain canopy, etc. Ease of Use: Ease of using canopy, backrest, safety harness, folding the stroller, etc. All of the strollers were of decent quality. The big differentiator among the companies seemed to be service. 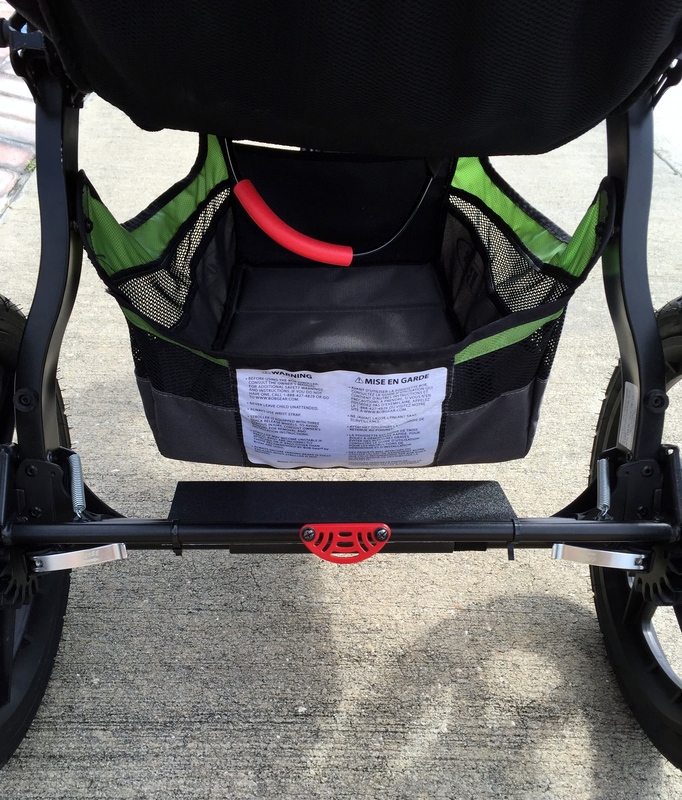 For a more in-depth review of each company and stroller, click any of the links below. The website is very nicely designed. Contact information is always visible on the screen, and there is a “Quick Availability Checker” you can use to see if your desired stroller is available. In addition to several single and double strollers to choose from, Kingdom also offers cribs and bedding. 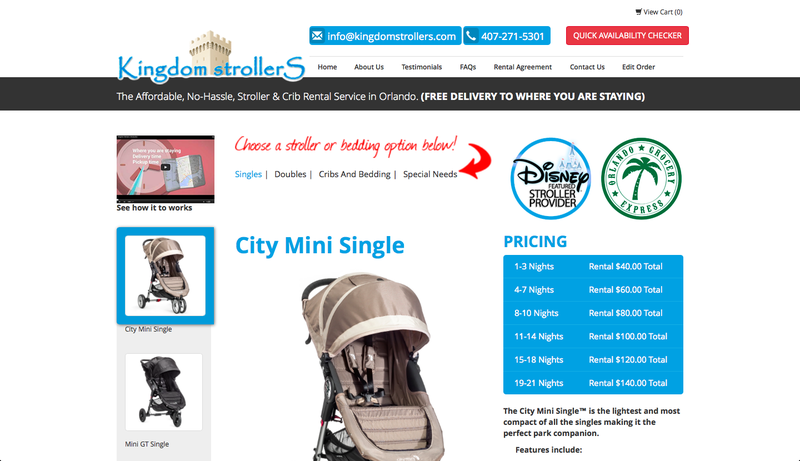 Kingdom offers the same strollers as both Magic Stroller and Orlando Stroller Rental. 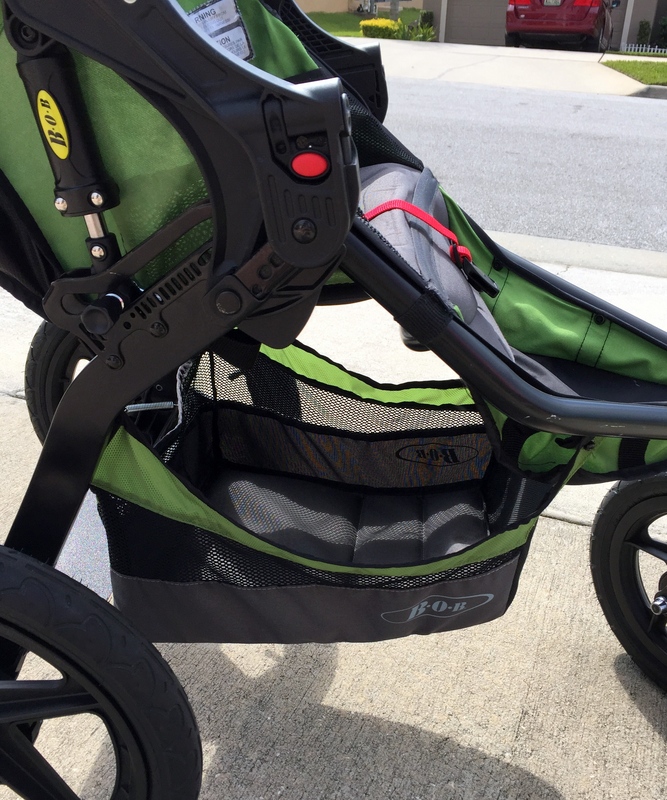 Because I wanted to test a variety of different strollers, I chose the BOB Revolution Flex Stroller. There is an option to add a complimentary rain cover and/or cooler bag, and you may include damage and theft insurance for $15.00. I added the rain cover and cooler. One nice feature of the website is its ability to specify a stroller drop-off at one resort and pick-up from another. If you plan on resort-hopping during your vacation, this feature means you won’t have to make those arrangements by phone. 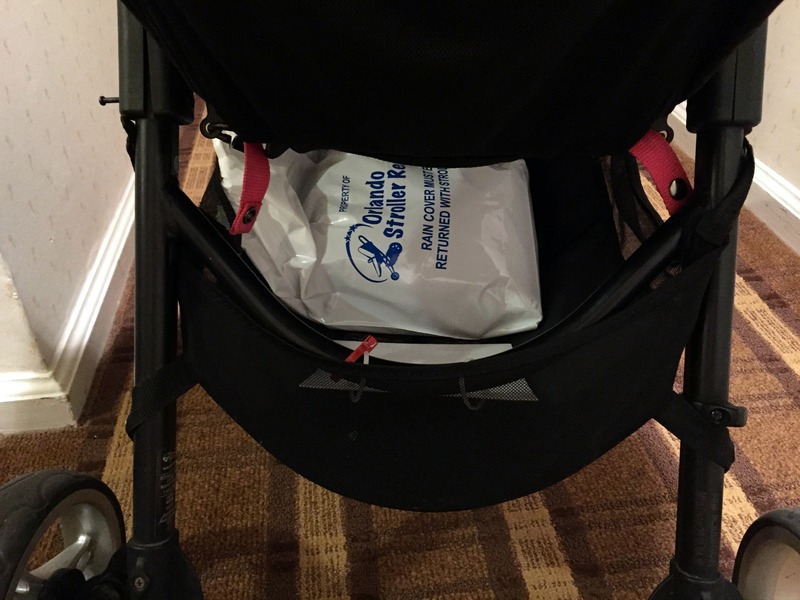 If your stay is more than 10 miles outside of Disney, you may still be able to have your stroller delivered for a $15.00 fee. 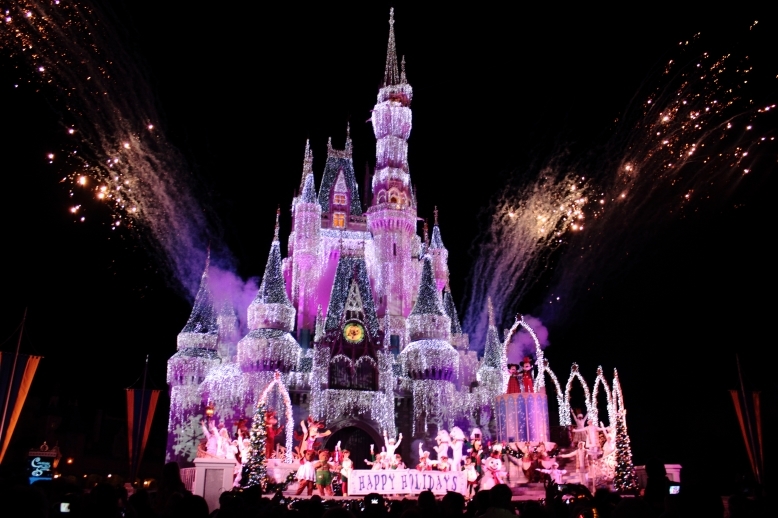 If renting for one day, the price is comparable to Orlando Stroller, but higher than that of Magic and Disney. If you are renting for at least three days, the prices are comparable across the board. My stroller was delivered to the Beach Club early in the morning, and I arrived at Bell Services to pick it up an hour or two later. The Cast Member had me sign a receipt book to acknowledge I’d received it. The stroller arrived in good condition. It was extremely clean and appeared both solid and durable. Tip Over Risk: During testing, I was unable to put my backpack in the storage basket, so I hung it on the handle. It immediately started tipping over backward. Hanging jackets or sweatshirts will be fine, but don’t risk hanging anything heavier on the handle. Folding: The stroller came with folding directions, but I wanted to try it out on my own first to see how user-friendly it was. As someone who had never used a BOB stroller, this was SO DIFFICULT to fold! To make sure I wasn’t the problem, I asked both my husband and uncle to try. It took the two of them ten minutes to figure out how to fold the stroller up. Below is a video demonstrating how to close and open the stroller. Note that this was after I had practiced five times to make sure I could do it on camera! Storage: This thing has SO much storage! 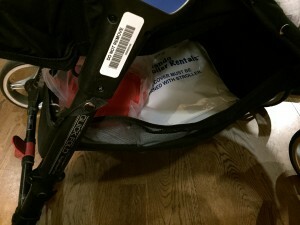 There is a storage basket located underneath the stroller and a mesh pocket in the back of the seat. 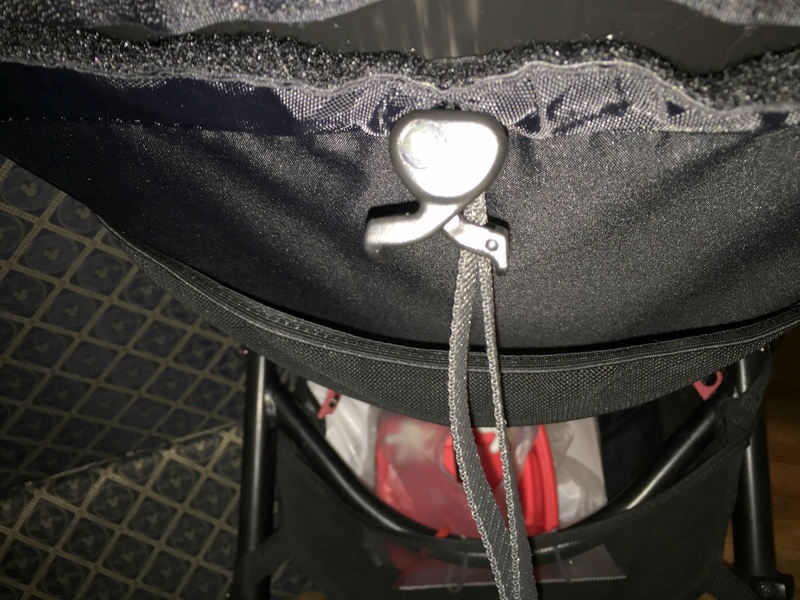 There are even two small mesh pockets on the sides of the seat to store your child’s food, toys, or sippy cup. Braking System: The brake can be engaged two ways. There is a red pedal that can be lifted up with your foot. There are also two hand brakes that you can engage when going down hill. You can see the hand brakes in the photo above. I had a very positive experience with Kingdom Strollers. The website was very easy to use, and I found the prices to be comparable with other stroller companies. They have a very good selection of strollers to choose from, and I appreciate the fact that they rent cribs and bedding. It truly is a one-stop shop! Website Main Page with all available strollers listed. The website is nicely laid out. 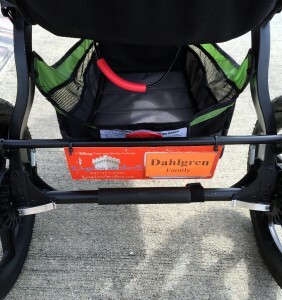 Photos of all strollers are featured on the main page, with the option to view details. The company’s phone number is always in the top right hand corner, no matter what link you clicked on. The best part of the website is its FAQ page, which has a comparison chart showing all strollers offered. Being able to compare the weight, height, and different amenities among the strollers made making my selection much easier. The FAQ page also answers common questions about renting a stroller. 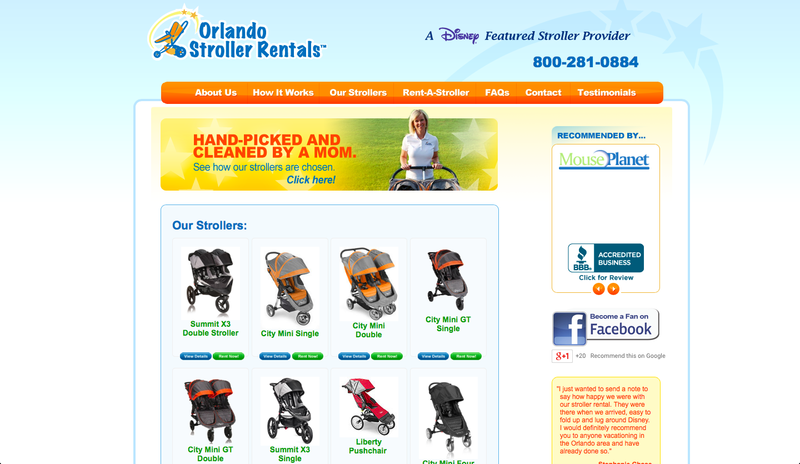 Orlando Stroller Rental (OSR) has a good number of both single and double strollers to choose from. 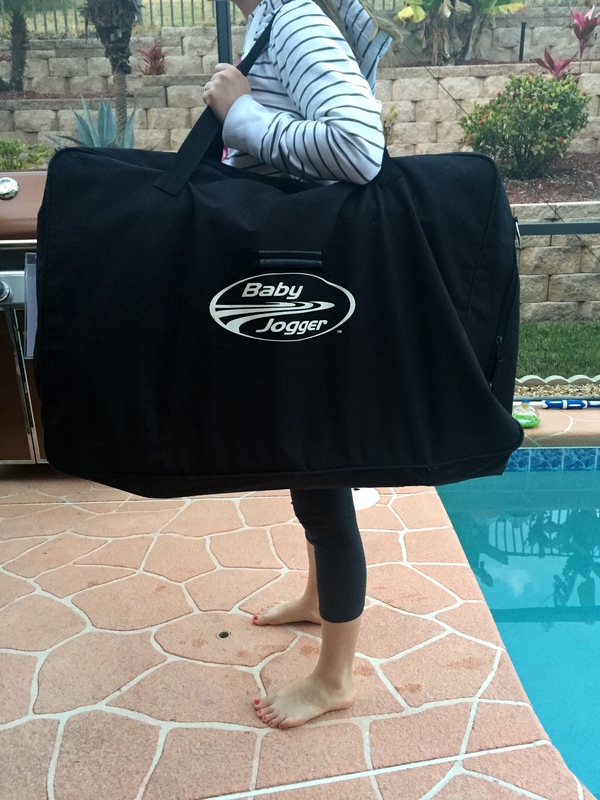 I chose the Baby Jogger City Mini 4-Wheel Single Stroller. I added the optional (and free) rain cover. They also offer optional insurance which covers theft and damage ($15.00 per stroller), but I decided to forgo that. OSR can stroller can be delivered to a private residence if it’s within a 15-minute radius of their store location. The stroller was clean and in good condition when I received it, with no huge scuffs or damage. Attached to the stroller was a name tag and card with pick-up and contact information. 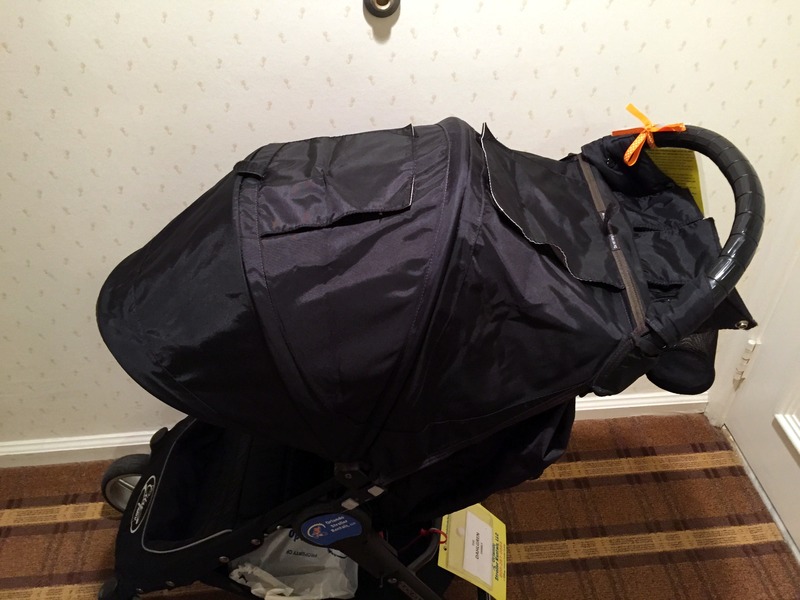 Our bellcap demonstrated how to fold the stroller before handing it off. It is without a doubt the EASIEST stroller I have EVER folded! With a light pull on a handle in the middle of the seat, it immediately folds in half. You could be holding a toddler in one arm and still easily fold the stroller with the other hand. Check out the video below to see just how easy it is. Note: This video applies to the Magic Stroller, as well, as the two are nearly identical. Handle: I really don’t like the handle. First of all, it is NOT adjustable. Secondly, because of the way it is curved, comfortable hand placement is difficult. Basket: This basket is SO hard to access! As you can see below, the curved bar makes it difficult to put things underneath. Seeing as the sides of the basket are elastic and not blocked by a bar (see photo), I had to go around the stroller to put things underneath. However, even then there were difficulties. 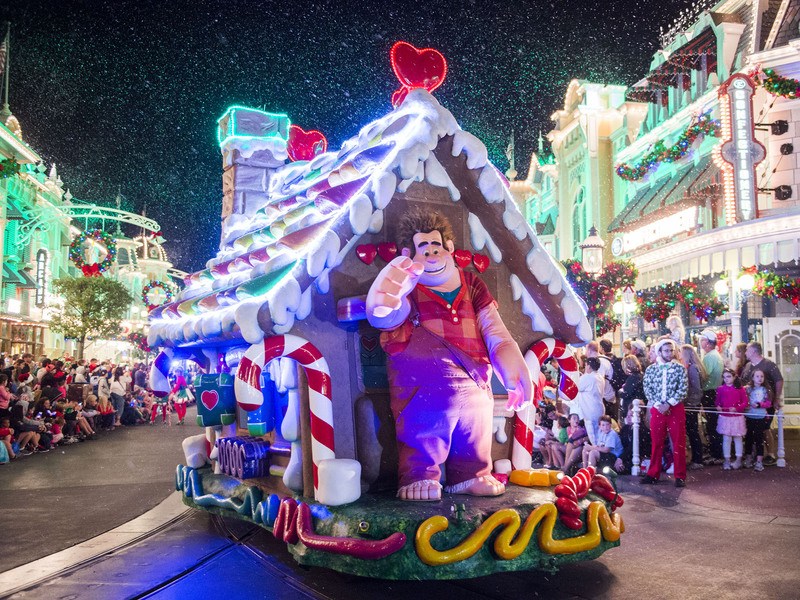 Only room for an empty Mickey sink and rain cover. The basket just doesn’t fit much. 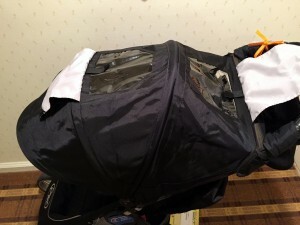 I had a backpack that I was using as a diaper bag and couldn’t fit it in the basket at all. I had to hang the backpack on the handle bar, which thankfully didn’t cause the stroller to tip over. 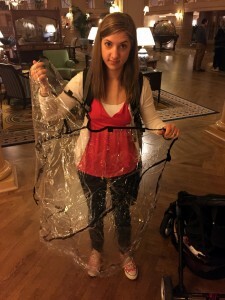 Rain Cover: It took me, a family member, and three CM’s at least five minutes to figure out how to put on this rain cover. It didn’t come with any directions and was so confusing! After several head scratches and plenty of gawks from innocent bystanders, we finally managed to put the cover on correctly. I took this cover for a spin outdoors and take heed: This WILL blow around in the wind, so I’m not sure how well this will protect your child in the event of a windy rain storm. Note the confusion in my face. P.S. I appear the size of a Hobbit but promise I’m 5’6. Handle: The handle is of a good height. My husband is six-feet tall and had no problem pushing the stroller. Because it’s higher up, he didn’t need to hunch over to push it. Reclining Feature: It is easy to recline the seat with one hand as you saw in the video demonstration. However, you need both hands to put it back up (which I don’t see as a con). It can be reclined to an almost flat position and provides a comfortable make-shift bed for tired little ones. 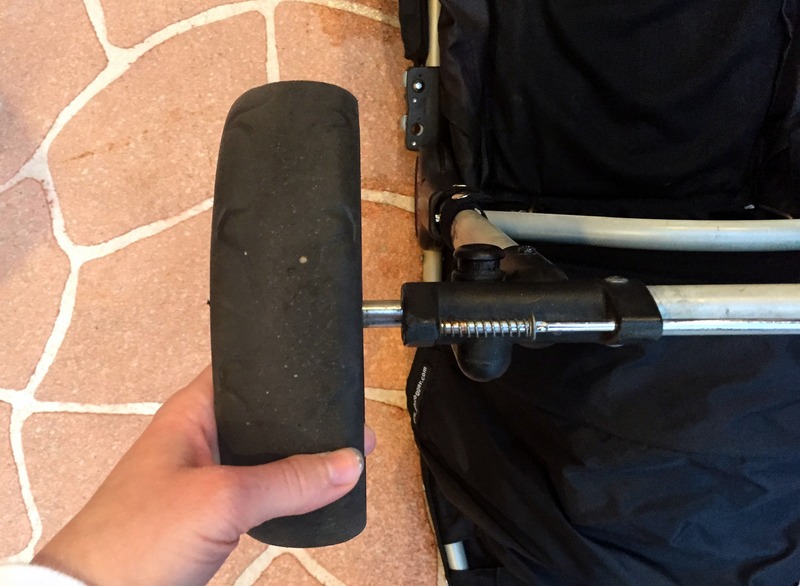 Wheels: This is my favorite type of wheel material for a stroller as the tires won’t pop should a rock or nail get embedded in them. They won’t deflate and do not need to be inflated. The wheels turn on a dime and glide over bumpy roads with ease, providing a smooth ride for my daughter. Canopy: This is the canopy of all canopies. It is HUGE. It is the perfect thing to shade your little one from the harsh Florida sun. In addition, there are two decent sized plastic windows (flaps kept closed by velcro) that allow you to check on your wee one. The canopy can also be removed by pushing the grey buttons on either side of it. Throughout my day, I had no real issues with the stroller. It drives well and maneuvers with ease. My overall impression of Orlando Stroller Rentals is a positive one. The website is user-friendly, and I love the comparison chart on the FAQ page. The website is okay. First of all, the text is far too small (see FAQ photo). When you click on a stroller photo, a link takes you to a demo video. The problem is, the video won’t play! Since there is very little text describing the strollers and no informational video, I had a hard time picking out a stroller. The best part about the website is the, “Where We Deliver” tab on the drop down menu. Here, you can search or browse over 250 delivery locations. In addition, each resort has its address and phone number next to it. When comparing these prices to other stroller companies, you’ll notice that these prices (for a one day rental) are much lower. However, when comparing prices based on a three day rental, the cost is similar across the board. There is an option to add theft and damage insurance for $25.00, as well as a complimentary rain cover. I decided against both the insurance and the rain cover. 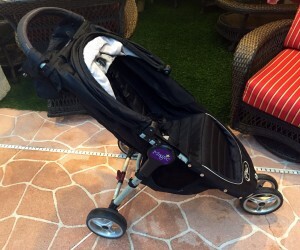 The stroller I chose was the City Mini Single Stroller by Baby Jogger. The day of delivery, I went to Bell Services at the Contemporary and inquired about my stroller. The Cast Member looked in a log book and did not see any notice of my delivery. He called the luggage room who said my stroller was not there. I called Magic Strollers four times and no one answer. So I made a contingency plan. 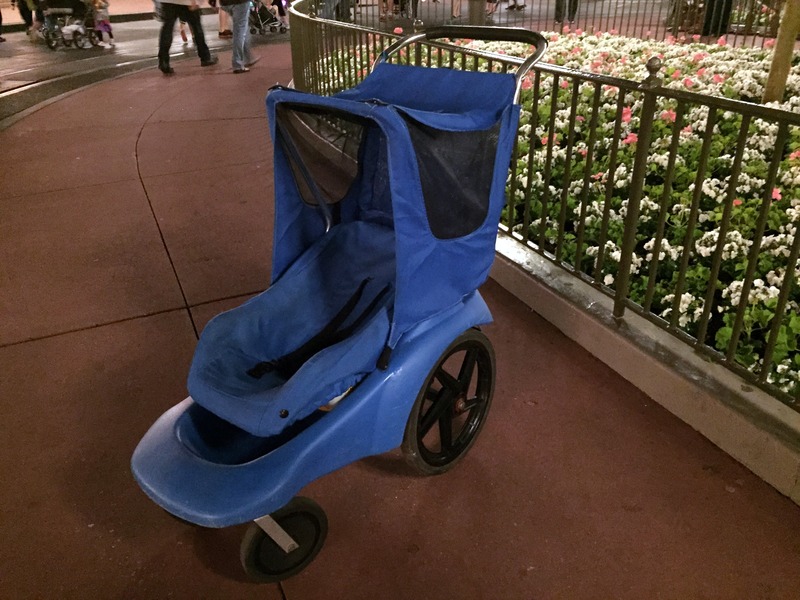 I needed to review a Disney stroller anyway, so I went to Magic Kingdom and rented one there. Hours later, I finally received a call back and was told the stroller was delivered. I was very surprised since the CM had told me it was nowhere to be found. I apologized for the confusion and rescheduled my reservation for a different day. I finished my day at Magic Kingdom and walked over to the Contemporary to follow up with them. I asked them to check again for the stroller. Minutes later, a CM returned with my long lost stroller. I politely asked where the confusion lay. The Cast Member said it was a breach in delivery protocol. Whenever a stroller delivery is made to a Disney resort, the drivers are to sign a log-in book when they drop off the stroller. When the guest picks up the stroller from Bell Services, they need to sign a log book stating they received it. In my case, the driver had NOT signed the delivery book when he/she dropped off the stroller. However, I will place blame on the Contemporary, as well, and question how hard they actually looked for the stroller, especially since I told them that it came in a bag. Following my trip, I called the owner of Magic Strollers, John, to explain the entire situation and inquire about the proper delivery protocol. Once again, I must have called three or four times before getting a call back. This was very aggravating. I spoke with John, as well as the owner of another stroller company. Both commented on how Cast Members working in Bell Services are terrible about actually looking for the strollers that get delivered. They just do a quick sweep and tell guests their rental never turned up. It appears that Disney Bell Services is the weak link in the chain. The current delivery process doesn’t seem as efficient as it could be and either needs to be followed more closely, or modified. What do you think? It’s not as heavy as it looks. A few days later, I finally received my stroller. This time, I picked it up from the Beach Club. It indeed came in a black canvas bag with a strap big enough to carry over my shoulder. Disclaimer: The pros and cons for both the Orlando and Magic strollers are identical. The only difference between the two strollers is the weight and wheel placement. Check out my in-depth review of Magic Strollers for a comparison of the two strollers. I really enjoyed this stroller. 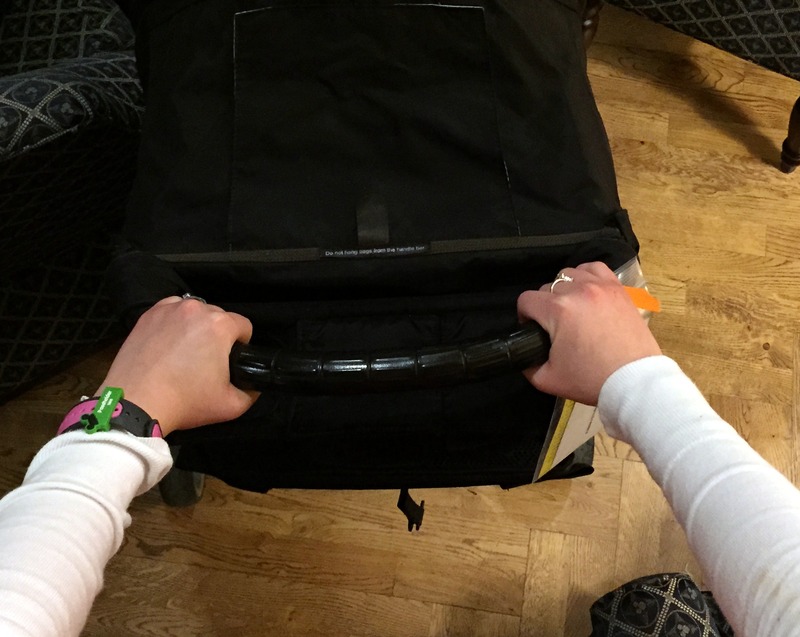 The front swivel wheel makes it easy to maneuver and it is a dream to fold up. Unfortunately, I wasn’t impressed at all by the website and was frustrated by the company’s inability to answer and return phone calls in a timely manner. The Disney stroller “website” is merely a web page off of the Walt Disney World website. 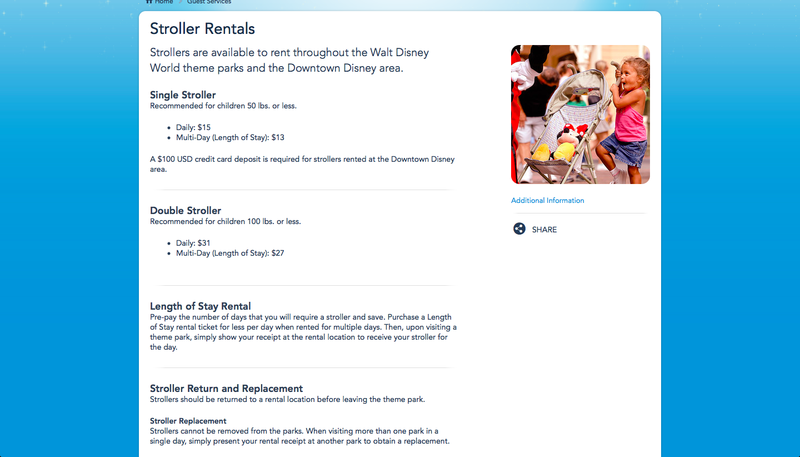 There is no place to reserve a stroller online as the strollers can only be rented from either one of the four parks or Downtown Disney. 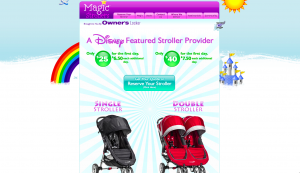 What separates this web page from any of the other stroller companies I reviewed is this: Disney is the only company who will refer its potential customers to other stroller rental companies. 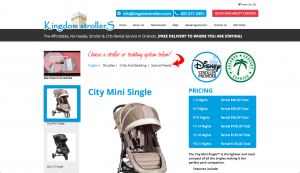 Featured on their web page is a list of Disney Featured Stroller Providers along with its accompanying website and phone number. These prices are cheaper than the other three stroller companies, and they should be. Not only are these strollers more basic (and much more uncomfortable), but they cannot be removed from the parks. If you decide to rent this stroller multiple days, you will have to pick up a new stroller at the rental station every day. I rented a Disney stroller from two different parks during my stay, and the process was exactly the same. While I went through the rental process with a Cast Member at the desk, another CM went to grab my stroller. The service was pleasant and very efficient without any wait. 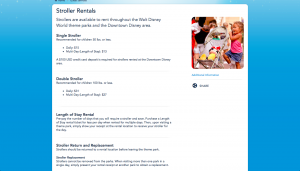 Insider’s Scoop: Cast Members can rent strollers from the parks for free! Because my daughter is small for her age, I rented an infant stroller. I know, I didn’t know Disney offered those, either! The difference between that and a single stroller is that the infant stroller seat is padded and reclined. The end. Anyway, the stroller was in okay condition. The padding looked worn, and there were scratches everywhere on the plastic. There were two small wheels in the front and two larger ones in the back that appeared to be made of hard rubber. I also noticed some rust around one of the wheels. Bumpy Ride: After using this stroller, it is clear that it does NOT come with shock absorbers. While driving on uneven terrain, my daughter was in for a bumpy and exciting ride. Seat Not Adjustable: There is no option to adjust any of the strollers. Insider’s Tip: If you do rent an infant stroller, stuff a blanket or coat behind your child. It will prop her up just fine. Storage: I wish this stroller had more storage. There is a great pocket in the back of the stroller and two small pockets on either side, but there is no storage basket underneath. Maneuverability: Although it doesn’t look like it, this stroller turns amazingly well. I can easily steer and turn it (with my child in the seat) with one hand with absolutely ease. It stops quickly and maneuvers through crowds very well. However, don’t let go of this stroller when you’re at an incline as it will roll away. Brake Pedal: The brake pedal is a bar that can easily be pushed down with your foot. I would go so far as to say it is the easiest brake to engage out of the four strollers I reviewed. The stroller performed as expected. It did what I needed it to do and absolutely nothing else. I was pleasantly surprised by how well it maneuvered, but my overall impression of the Disney stroller is: eh. If you have no other option or are in a bind, this will do. 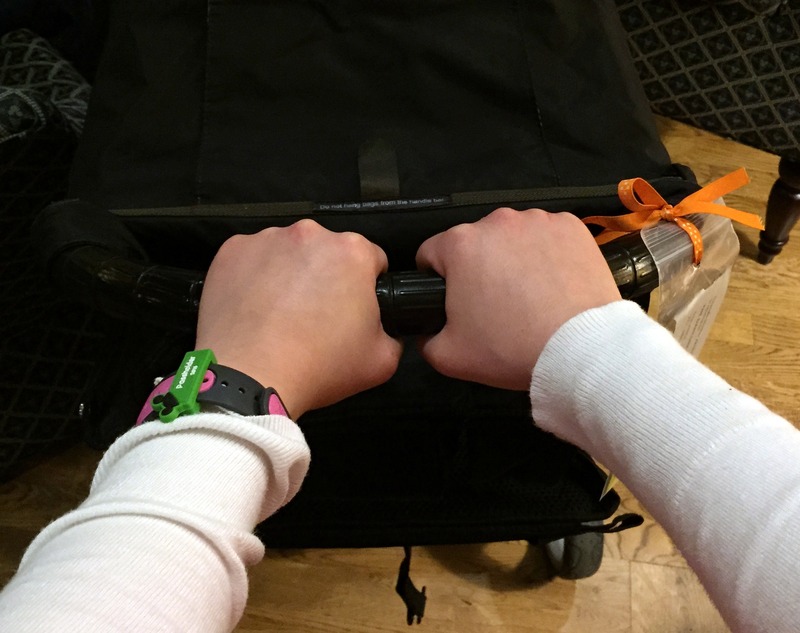 If you have an alternative stroller solution, go with it. So after all is said and done, what was my favorite stroller? I really enjoyed the City Mini Single from Magic Strollers. Because of the front swivel wheel, it maneuvers especially well through crowds. The reclining seat is easily adjustable and I love love looove how easy it is to fold. Because of the lighter weight, I can easily hold my daughter and carry this onto a Disney bus. Extra perk? It is also offered by Kingdom Strollers. If you can’t get a hold of that stroller, try out the City Mini 4-wheel from Orlando Stroller Rentals. It’s essentially the same stroller, just a few pounds heavier. As for my favorite company, you can’t go wrong with Kingdom Strollers and Orlando Stroller Rentals. Both had user-friendly websites, good quality strollers, and are companies I would definitely rent from again in the future. Which company have you used? Which stroller is your favorite? Let me know in the comments! 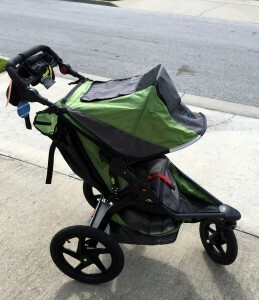 I’ve rented from kingdom strollers multiple times and always had a good experience. Also rented a full size crib twice and highly recommend them. Folds up and with wheels so really easy to push out of the way in daytime. Will never go back to the pack and play, so worth it. Now I just wish we could get them everywhere we travel. I haven’t tried the crib yet, but it’s good to know you had a good experience on that front as well. I’ll have to consider using them crib-wise on my next visit. I agree with you about the stroller. It was so hard to close! At least we know it’s just the stroller brand and not Kingdom’s fault. I rented from Kingdom a few years ago and had a question about the rental a few weeks before our trip. The owner followed-up with me very quickly, even though his wife was at the hospital in labor! I thought that was pretty amazing customer service! What customer service! I have only ever heard good things about the company. They’re doing it right! I rented from Kingdom Strollers just 6 weeks ago and was amazed from start to finish, with their extremely easy to use website and the stroller I received was literally an out of box City Mini GT double which we loved. But the reason I am taking the time to write this is b/c of their excellent service! After my second day at the parks, I called Kingdom and the owner himself answered. He was very friendly. Although my stroller had already been delivered, I asked him if he could deliver us more of the great-priced water they have as an option on their website. He was extremely friendly, and very quick to take the time to accommodate my family and three more cases of water were waiting for me at the resort later that evening. Thanks Kingdom, I’ll be renting from you again soon when we visit the parks again in the Fall! Isn’t that City stroller amazing? It’s making me consider selling my current stroller and getting a City one! So easy to open and close and just a nice stroller overall. 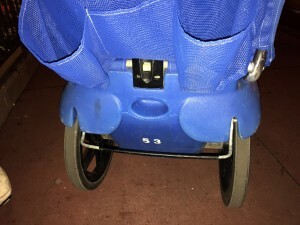 I often hear that these featured partners or whatever they are called are the only companies that can just drop off and pick up at the resorts, but we’ve rented strollers from Apple Scooter for several trips now, and we haven’t had to be present to meet the guy for pick up or drop off. Moreover, been very happy with them. Strollers have been nice and clean, and the price is unbeatable. Apple is a preferred vendor (on the electric scooter front) and we have used them several times when my mom has needed a scooter. You’re indeed right that they drop off and pick up without your presence. We have always had a great experience with them. One thing overlooked about the Disney strollers is that they can accommodate larger/older children than the strollers from the other services. Last year we got strollers for our six year old triplets – one double for our son, who is tall and 70 lbs, and one double for our daughters (who are smaller) to share. This worked out well. Some may debate how old is appropriate for strollers, but saving the 6 year olds from miles of walking in the heat really made for more enjoyable days. We plan on doing this again when we go down in June, and this is probably the last year that they’ll fit, but we’re happy to milk it as long as possible before they have to walk the parks. I agree with you there. Those strollers are definitely fit for children of all ages/sizes. For $15 a day, it’s worth it if it means you and your family can enjoy the parks longer. Any chance we could get a similar article for ECVs? We had to rent on the fly last year after our first day in the park proved too much for my father-in-law. This time we’re going to have one waiting, but it would be really nice to have this kind of info going in. I wrote an article about our experience using an ECV that I really encourage you to look at. Perhaps the post (and the comments below it) will help you out. We’ve rented from Apple Scooters twice and have had a great experience both times. They were affordable and the scooter was delivered before we arrived at our hotel. Hope that helps and I hope you, your family and your father-in-law have a great trip! Check out a City Mini GT next time. I rented one from Orlando last time and will be getting a double for our upcoming trip. Slightly larger wheels than the city mini, adjustable handlebar and hand break (flip flop friendly). They are awesome. I will definitely have to consider the GT next time. That adjustable handlebar would be great! So can I assume that wdw gets no financial benefit from the stroller companies (even though “partners” or whatever? Is this possibly part of the reason the CMs don’t seem to care much? 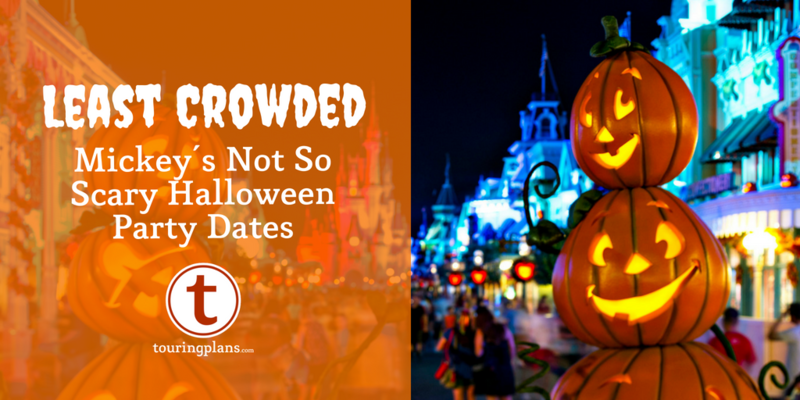 It seems since wdw has no skin in the game and can place the blame on an outside company, there is little to no incentive to put much effort into this. I will say, though, it is seems that it makes things that much more difficult if you cannot get in touch with anyone at the stroller rental company while you are standing at the front desk. From what i’ve heard (don’t quote me on this), Disney gets a small percentage if the company is listed as a preferred vendor. It was frustrating not being able to contact the stroller company immediately, but it all turned out okay in the end.